This is hardly news, but the Opposition continued to be uninspiring last week. If a country is going to change its constitution, it really ought to be worth the bother. But the most encouraging thing about the draft published by the UNP on Wednesday is its support for provincial level devolution within a unitary state, which is exactly what is already in place thanks to the 13th Amendment to the existing constitution. It is also one of the few commitments to which voters would trust it to stick in the unlikely event of Ranil Wickremasinghe being elected. The Government should grasp this opportunity to confirm its own position and forge a consensus of what should be the vast majority of the country, rather than using it as an excuse to change direction and side with a few extremists in the form of the JHU and the NFF. There is a lot of space in the centre of the political spectrum in Sri Lanka, and Mahinda Rajapaksa should see the importance for the long term future of the SLFP of occupying it. Sadly, by comparison with its attempts to challenge the Government on the economy, this rather underwhelming move by the UNP is absolutely brilliant. The strike against the electricity tariff hike was pathetic. It was either too little too late or too much too soon. Even though this was an issue that had caused a major stir in the country, particularly with the urban middle class who should be the least attached to the Government, participation was extremely limited. And of course this is not so surprising since the action was really very badly timed, coming well after the President had stepped in to give the impression that he was rolling back some of the increase. It made the Opposition look ineffective – or I guess I should say even more ineffective – when it should have been gaining strength from its successful protest the previous week. Having made a mess of that, it is now back to the business of trying to make less important problems look both vital and urgent. Thus Harsha de Silva has been deployed to ‘expose’ the possibility of an impending debt crisis. To do this, he has been employing the recently published report of the IMF on its annual consultations with the Government. He says that the IMF has ‘revealed’ figures that the Government wanted to hide, in the form of the consolidated budget deficit. This stands at 8.6% of GDP, compared to a budget deficit of 6.4%. The claim is that the Government is trying to hoodwink the public into believing that the economy is in better shape than is the reality. This being something people tend to be quite willing to accept, no doubt he thinks that he’s onto a winner. The trouble is that the more often you predict disaster and it doesn’t happen, the less you look as though you know what you’re talking about. The fact is that there are several different versions of the budget deficit, and they are used for different purposes. Harsha de Silva would know this, being an economist. And Ranil Wickremasinghe would know it, because the UNP too talked of the budget deficit and not the consolidated budget deficit in the brief period when he was Prime Minister. In any case, even if we all agreed that the consolidated budget deficit is ‘best’, the data to calculate it from the budget deficit is in the public domain. This doesn’t mean that the Government isn’t trying to deceive people. It means that the Opposition has no idea whether the Government is trying to deceive people. It means that the Opposition has no idea whether the country is overburdened by debt. And that’s a pity, since a debt crisis wouldn’t be much fun. Interestingly, the IMF seems to think that the Government is moving in the right direction, and that the prospect of such an unfortunate eventuality is diminishing. The major problem, according to the IMF, and as I have said on numerous occasions, is the very low level of tax revenue in Sri Lanka. The Government having decided that the IMF is correct to insist on cuts in the budget deficit, shortfalls in tax revenue mean that expenditure has to be curtailed, which even the IMF now accepts is detrimental to economic growth. The UNP has been making some noise about taxation in recent weeks, which is long overdue. But if it is to make a serious contribution, it must say how it would raise more tax. Taxation obviously isn’t the only issue, since a significant amount of the debt that administrations in Sri Lanka have incurred over the years is due in foreign currency, which means that even more foreign currency has to be earned by the country to make the repayments of the capital plus interest. As demonstrated as recently as the beginning of last year, when reserves of foreign currency fell to the equivalent of 3.2 months of imports – three months being the usual point at which panic sets in – this is not so easy. Towards the end of the war, they reached 1.2 months of imports and the Government had to agree to an emergency loan from the IMF, with all its associated conditions. The IMF being particularly obsessed with the ‘losses’ of the CEB and the CPC, this is clearly a situation that the Government would like to avoid if at all possible. I wrote a few weeks ago about Sri Lanka’s increasing dependence on workers’ remittances, which now bring in $6.0 billion, compared to $4.0 billion from exports of textiles and garments, $1.4 billion from exports of tea and $1.0 billion in tourism receipts. In the context of a downturn in the country’s key export markets in the US and EU, it is easy to understand why the Government is happy to see remittances take on such an important role in the economy. Not only do they flow primarily from other parts of the globe, but so long as those countries remain willing to accept migrants, they also tend to be more stable than export earnings, since they are generally sent by individuals to their families. However, as I said, this is clearly not a happy situation, since most people don’t want to have to travel thousands of miles to earn a decent living. I asked what the Government’s plan was for generating proper jobs at home. Connected to that should be the question of what it is doing to boost exports. 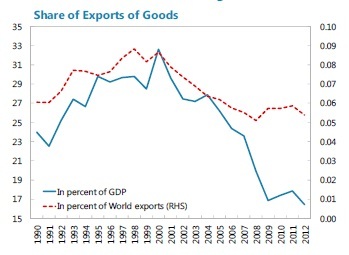 Both the share of exports in GDP and Sri Lanka’s share of world exports are falling. If that were only the result of lower demand in the US and EU, it would be reasonable to do what the Government appears to be doing and borrow abroad to cover the shortfall. The debt could be repaid when exports recovered. However, one of the infinitely more important facts highlighted by the IMF report is that these figures have been falling since 2000. In other words, it is not a temporary glitch. A very useful recent article by Verite Research on the electricity tariff issue has shown exactly what can happen when the Government acts on what it hopes the future will bring and it is wrong. They say that the extraordinary ‘losses’ of the CEB in 2012, which surely contributed to the recent hike, were to a large extent the result of a gamble. They show how over the last decade the CEB has been relying much more heavily on hydro power, which is cheapest, assuming that low rainfall in one year will be compensated in the next, and how this strategy was employed to an even greater – by implication reckless – extent in 2010 and 2011, because the authorities thought that they had the Norochcholai coal power station as a back-up. What actually happened was that Norochcholai broke down, as it does regularly, and because reservoirs were already so close to empty, the CEB had to resort to expensive oil generation by the private sector. This is also why the country was subject to major blackouts, which would have cost the economy a lot more than the CEB had to spend. In a sense, this is not much different to the oil hedging fiasco that got the CPC into trouble in 2008. The Government thought that it would be a good idea to enter into contracts that would save it money if oil prices continued to go up, but failed to consider the impact of a collapse in the market. As these examples demonstrate, the Government isn’t very good at managing risk. In fact, as various commentators said after oil prices plummeted from nearly $150 per barrel to well under $50, that doesn’t seem to be its objective. Rather, it would appear to be speculating, which is all very well when it is right, but otherwise potentially disastrous. No wonder people worry about a debt crisis. The Opposition plays on their fears in the hope of generating a reaction. With every new loan the Government takes, it gives the impression that the world is about to end. No doubt that is simpler than trying to understand whether that particular deal makes sense, working out what it would do instead and explaining the whole thing to the electorate. But that is what the UNP would have to do if it were running the country. It’s about time it started to look like it could. This article was published in The Island on 5th June 2013. The internet version may be accessed here. When launching an initiative in Sri Lanka, it is well known that one should be careful to call it the opposite of what it really is. Worried about infighting? Then be sure to include the word ‘united’ in the title. Concerned that the dubious public image of the leaders may dissuade people from joining up? Then it is inspirational concepts like ‘freedom’ that one needs to reference. Sarath Fonseka’s latest attempt to resurrect his political career was a flop. Several hundred people came to listen to him speak. But he could not get the support of any established political parties, which is after all what is needed when it comes to winning elections. The organisers didn’t bother to invite the TNA, the JVP was united in ignoring the event, and even the UNP reformists weren’t keen on attending – Sajith Premadasa was convinced from the off that it wasn’t worth the struggle with Ranil Wickremasinghe, while Karu Jayasuriya left it to the last minute to decide to drop out. Even the remnants of the DNA, which Sarath Fonseka himself established, didn’t all show up. As such, Sarath Fonseka proved once and for all that his role as the ‘common candidate’ in the 2010 presidential election campaign was a one-off. It was an extraordinary contest at an extraordinary moment in the country’s history. Just a few months after the end of the generation-long war, the Army Commander took on his Commander-in-Chief. He will not get another chance. Few people believed Sarath Fonseka’s pledge to abolish the Executive Presidency when he made it the first time around. Indeed, even he didn’t seem totally convinced, so busy as he was making promises. I certainly didn’t trust him to give up power. For why did he enter politics? Because he was upset at Mahinda Rajapaksa’s refusal to allow him to further increase his empire as Army Commander. His plan for the post-war expansion of the Army was rejected by the Government. Critical as I am of Mahinda Rajapaksa, I believe that this decision indicates that he is not as bad as Sarath Fonseka might have been. Also, justified or otherwise, Sarath Fonseka was commonly regarded as a guy concerned more with ends than means. Even if this was necessary in the circumstances, which is debatable, surely we can all agree that it is not a desirable trait in a peacetime leader? In peacetime, there can be no discussion about the acceptability of exceptions to the rule of law, although, as we have seen in the last three years, they may still occur in abundance. (Mahinda Rajapaksa is working hard to develop a similar reputation for himself.) But although we do not know for sure who is responsible for many of the worst crimes committed during the war, such as the various attacks on journalists (now totally forgotten, unlike the attempted assassination of Sarath Fonseka, one of the perpetrators of which was sentenced to 35 years rigorous imprisonment this week), I don’t think that there is any chance that Sarath Fonseka is less guilty than Mahinda Rajapaksa. I also believe that symbolism is important. Sri Lanka’s president should not be a military man. It is for the same reason that the proposal being advanced by various people in the last month or so for the Ven Sobitha Thero, Chief Incumbent of the Kotte Naga Vihara, to put himself forward as a ‘common candidate’ is also undesirable. The real question for those who advocate a ‘common candidate’ is whether or not they can trust the UNP. I think that last week’s rally gave us a good indication of the future, and it is a future without the National Movement for Social Justice. The UNP may be divided, but its various factions are clearly agreed on one point – it will be putting up its own candidate for the next presidential election. Ranil Wickremasinghe will of course try to make sure that it is him. After all, he will only have been party leader for a mere 20 years by then! But he won’t have an easy time. Sajith Premadasa is perhaps starting to think that he might make it, while Karu Jayasuriya undoubtedly hasn’t given up hope either. Sarath Fonseka’s role as the ‘common candidate’ in the 2010 presidential election campaign was only possible because the UNP was sure that it could not win, the vote taking place so soon after the war victory. Rather than ignoring this reality, people interested in anything more important than Sarath Fonseka’s political career had better shift their focus away from distractions like the National Movement for Social Justice and back to where it is needed. This article was published in The Island on 25th October 2012. The internet version may be accessed here. Mahinda Rajapaksa must really love elections. Since he came to power, at least some part of the country has gone to the polls almost every year, sometimes more than once. We had local and provincial council elections in both 2008 and 2009, parliamentary and presidential elections in 2010, more local elections in 2011 and now more provincial council elections in 2012. No prizes for guessing that in 2013 somebody somewhere in Sri Lanka will be voting. I hope that it will be the turn of the Northern Province. Concerns have been raised about the prospect of a TNA-led administration in the North, on the basis that the party may use the platform to push for more devolution or even a separate state, by itself or with the support of the West. Indeed it might. The TNA hasn’t done enough to distance itself from the use of violence to achieve political ends, or to distance itself from the goal of Eelam. Both would have been helpful for its constituency and for the country, since distrust of the TNA’s intentions encourages or is used as an excuse by the Government to delay the much-discussed ‘political solution’, or to avoid it altogether. Perhaps the TNA is under pressure from the diaspora, or maybe it is yet to be convinced that the war is over. Whatever, keeping it out of power by undemocratic means isn’t going to convince either the party or its supporters to change their ways. The voters of the Eastern Province demonstrated as much on September 8th. There have been many fascinating attempts in the media to present the results of the provincial council elections in the East as a resounding endorsement of the Government and its policies. However, this is no more than wishful thinking. For a start, the UPFA won by a margin of less than 1%, receiving 31.58% of the popular vote compared to 30.59% for the TNA. Given the usual massive abuse of state resources by the incumbent administration, it is ridiculous to suggest that people are anything like enthusiastic about Pillayan et al staying on at Trincomalee. Also and most importantly, while the UPFA’s vote share fell by well over 10% of the total, the TNA’s went up by nearly 10% – it secured only 21.89% of the popular vote in the 2010 parliamentary elections. The TNA now enjoys the support of the vast majority of Tamils in the East. And it got eleven Tamils elected to the provincial council, compared to only one from the UPFA (the former chief minister, whose achievement has been questioned). Being out of office clearly isn’t a problem for the TNA in terms of popularity. Of course it isn’t. While the Government insists that life is now very good in the former conflict areas, a lot of people living there don’t agree. They aren’t so hopeful about Mahinda Rajapaksa’s development agenda. This we know from many sources, including the fact that according to official figures, 2,992 Sri Lankans crossed the sea to Australia in the first eight months of this year, compared to 736 in the last twelve months of the war. The vast majority of them were Tamils. And this data includes only those who reached their destination, not those who are now being caught by the Navy on an almost daily basis. Everybody is debating whether or not they should be classified as refugees, as if it would be quite normal for so many people to want to undertake such a perilous journey for economic reasons – it is not. The TNA must know that its prospects are only going to improve the longer it is prevented from challenging the Government, so it isn’t going to feel at all pressured to fall into line. The other point to note from the East is that the SLMC too increased its vote share. At the 2010 parliamentary elections, the SLMC and UNP together achieved 26.57% of the popular vote, increasing to 32.80% in 2012. The ever-hopeful supporters of Ranil Wickremasinghe may like to think that the UNP is the party whose fortunes improved, but that is plain silly. It achieved 11.82% of the popular vote in the provincial council elections, compared to 20.98% for the SLMC. And for their information, 11.82% is pretty close to zero! The UNP is in a deep hole, electorally speaking, but it is hard to feel sorry for people who believe that clinging to the same leader for nigh on two decades is perfectly normal. If only their foolishness didn’t have such an impact on the rest of the country. It is equally clear that the SLMC would not have seven provincial councillors if it had run under Mahinda Rajapaksa. The party leadership’s rumoured decision to form an administration with the UPFA, going against the wishes of its members from the Eastern Province and likely also the views of its voters for the sake of concessions in Colombo, is not very democratic. Totally undemocratic are the moves reported by DBS Jeyaraj to persuade five of the eleven provincial councillors from the TNA to switch their allegiance to the UPFA, which if they had been successful would have given the Government its all-important majority without the need for the support of the SLMC. DBS Jeyaraj says that the TNA representatives were approached by military intelligence operatives with a range of ‘carrots’ and ‘sticks’, including the offer to one provincial councillor who is also a building contractor of a major state infrastructure project and the threat to another that his young son would be taken into custody for alleged involvement with the LTTE. As DBS Jeyaraj points out, attempts to engineer crossovers are nothing new, although the employment of military intelligence operatives certainly adds a novel and even more reprehensible dimension to the phenomenon. Also, we don’t normally get to hear the details of the ‘carrots’ and ‘sticks’. For this we should be grateful to the TNA. It has shown us what politics in Sri Lanka has become, and how difficult it will be to clean up – Mahinda Rajapaksa is clearly very good at engineering. I hope that we will find more reasons to thank the party once elections are called in the North. Although the TNA did not stand up to Prabhakaran, for which it deserves the harshest of criticism, it is willing to stand up to the Government. And it would be in a position to do so in the Northern Province. A TNA-led administration could do what most Sri Lankans now agree is necessary and show the Government that it cannot get away with everything everywhere. The danger for the TNA and indeed for Sri Lanka as a whole is that as things stand its positions and actions can easily be dismissed as sectarian and extremist, which could end up deepening the divisions in society and further entrenching the Government. For that reason, and of course also as a matter of principle, the West should firmly resolve to say and do absolutely nothing. It is only a matter of time before Mahinda Rajapaksa starts to fear elections. This article was published in the Midweek Review on 19th September 2012. The internet version can be accessed here. The rise of Basil Rajapaksa has been rapid to say the least. Having spent years out of the country pursuing other interests, his return to support his brother’s presidential campaign was unexpected. Even more surprising was the popular backing he managed to acquire within a very short period in an unfamiliar district – he recorded the highest number of preferences in Gampaha in the 2010 parliamentary election, about as many as the next three candidates combined. He is projected as a man who gets things done. The idea is that he will do for the economy what Gotabhaya did in terms of security, with Mahinda Rajapaksa being the figurehead who holds it all together. The family brand is now so strong that people either love them or hate them. It is perhaps understandable that Mahinda Rajapaksa is so obsessed with his family. Politicians adore power and want to hang onto it for as long as possible, and in this region in particular one means of extending their period of influence is to promote their relatives, lining them up for eventual succession. Some months ago, Namal Rajapaksa gave a most amusing speech in Delhi at a forum on ‘political dynasties’ in which he claimed that the only real advantage of being the President’s son was that it had been slightly easier to get a nomination to contest elections. He argued that it was then up to the public to decide. This must be one of the most ridiculous statements of 2012. Yes, they have to collect votes, but even if they do so honestly on the basis of their image and not through the abuse of state resources that we all know is rampant in Sri Lanka, their image is only partly reflective of their capabilities. It is far more dependent on the opportunities they are given. And both Namal and Basil have had a lot of help. Why does Sri Lanka even have a Ministry of Economic Development? Because after the 2010 parliamentary election, Basil wanted a portfolio that would enable him to get involved in everything that might help to increase the family vote bank while making him responsible for nothing that could jeopardise it. The Economic Development Ministry undertakes programmes that involve distributing freebies, money and jobs, especially focusing on young people in rural areas. Divi Neguma is an excellent example. Launched in 2011, its first phase involved the creation of one million home gardens. A lot of people were recruited to go around handing out seeds and equipment, or the money to buy them, and the whole exercise was given a lot of publicity. Never mind the impact of an increase in household production on farmers, since their marketing problems are the responsibility of the Minister of Agriculture. Or is it the Minister of Agrarian Services and Wildlife? Livestock and Rural Community Development? Rural Affairs? Could Divi Neguma be run by the Minister of Food Security? Does anybody actually remember who is responsible for these subjects? Mahinda Rajapaksa believes in the centralisation of all useful power in the hands of his family, and the distribution of all useless responsibilities among as many other people as possible, so as to reduce the likelihood of any challenges to his authority from both inside and outside his governing coalition. He is constantly on the lookout for Parliamentarians he can induce to join the Government. Crossovers weaken the Opposition, but they also dilute the influence of each Cabinet Minister – instead of being one of about 20, they are now one of 60. The resulting confusion obviously creates tremendous wastage and inefficiencies, which people ‘tut tut’ about from time to time. But wastage and inefficiencies are only really actively opposed in Sri Lanka when they are sins committed by provincial councils. People are ever ready to find reasons to get rid of provincial councils, and their consumption of resources without producing much in the way of improvements to well-being is the issue cited most often as justification. However, this problem too is created by the Government. Provincial councils don’t get a lot done because the Government doesn’t want them to do a lot. The Government implements whatever projects it likes, wherever it likes, never mind whether their subjects fall within its purview or within that of the provincial councils. Cabinet Ministers may be given a chance to get involved to stop them feeling too bad about their increasingly powerless situation, but the really important stuff is bound to be given to a member of the Rajapaksa family. Why else would Basil have been put in charge of reawakening the East and bringing spring to the North – as far away from his constituency as one can get while remaining within Sri Lanka’s borders? It is obviously nonsense to suggest that there are no capable people in the Northern and Eastern Provinces, or that the Chief Ministers couldn’t have done the job with appropriate support from Parliamentarians representing those areas. There is not even the explanation generally put forward as regards Gotabhaya, that Mahinda Rajapaksa really needed somebody he could trust due to the sensitivity and urgency of the situation during the war. There was no justification for giving the responsibility to Basil. I have made the same argument about the recent expansion of the Ministry of Defence to include street cleaning and landscape gardening as surely the world’s only Ministry of Defence and Urban Development (‘The Army’s No-War Games’, The Island, June 20th). Gotabhaya is apparently now spearheading the Rajapaksa family’s popularity drive among the middle class in Colombo. Mahinda Rajapaksa doesn’t want devolution on anything other than a highly selective basis to people who won’t be in a position to use the power they are given meaningfully. Divi Neguma is his ideal model. The key actors in the programme are community-based organisations, which operate in just one Grama Niladhari division or indeed in only part of one Grama Niladhari division. This is supposed to be empowering. Indeed it might be if there was a mechanism to enable these community-based organisations to have a say on policy – if the process were actually democratic, in other words. However, this is clearly not what is intended. They are given every opportunity to discuss amongst themselves, in a whole range of different forums at the local and even national level, no doubt involving plenty of wastage and inefficiencies that people won’t mind in the slightest, but all important decisions are taken by somebody else – Basil and officials under the control of Basil. Provincial councils, which could reasonably expect to be in charge of work to promote home gardens, and more importantly to decide whether promoting home gardens is really the best option to make people in their areas better off, aren’t given the chance. They are not the ones with the money. Why discuss this now? Because the Government is in the process of further extending and formalising this way of operating by means of a bill that transforms what was once merely a programme into a permanent structure of the Government – the Department of Divi Neguma Development, to be established within the Economic Development Ministry – which will also take over the work of regionally-focused development bodies such as the Udarata Development Authority and the Southern Development Authority, plus the work of the Samurdhi Authority. The move is being challenged in the Supreme Court this week by a range of different groups, including the JVP. A particular concern is that money deposited in Samurdhi Banks could be used by the Ministry of Economic Development without oversight, while the bill says that officials will be required to maintain absolute secrecy about their work, which is rather unusual. However, it is the implications for the coordination of the development process that are most disturbing. Is Sri Lanka really best served by a system in which everything is decided by one, two or at best three people in Colombo? Even if passage of the bill is blocked as a result of this legal action, it is clear that the real work will still remain to be done – the growth of Basil’s empire will be only slightly affected. Mahinda Rajapaksa will pay no attention, certainly. He will continue to promote his relatives, in the expectation that being the President’s father will bring plenty of benefits in his dotage, and the space for others to contribute will continue to be closed down. People may not feel very inclined to care about the fate of politicians, such is the frustration that has built up. The fact that internal democracy is as much of a problem in the SLFP as it is in the UNP doesn’t seem very important. However, it is through political parties that change has to come. The impact of their internal problems is being amply demonstrated by Ranil Wickremasinghe, who is preventing the Opposition from mounting a serious challenge to the Government by refusing to give up the UNP leadership. What Mahinda Rajapaksa is doing to the SLFP should be equally obvious. Reforms are needed, and soon. Basil Rajapaksa’s admirers shouldn’t get agitated by this suggestion – if he is as competent as they believe, he can manage without so much assistance from his brother. This article was published in the Midweek Review on 29th August 2012. The internet version can be accessed here. Everybody knows about the crisis in the UNP. Of the many elections there have been in Sri Lanka in the last two decades, it has lost all but one. This includes four presidential elections and four out of five parliamentary elections. And it will have the opportunity to lose a few more in September, as the Eastern, North Central and Sabaragamuwa Provinces go to the polls. In the last general election, it could secure only 29% of the popular vote, worse than either of the two major parties have fared in a very long time. The main reason for its failure was identified last year in a survey by the Centre for Policy Alternatives. It found that less than 20% of Sinhalese support the UNP. And although the party does rather better than the SLFP with minorities, it has to compete with ITAK, which is backed by more than 50% of Tamils, the CWC with about 30% of Up Country Tamils and the SLMC and NUA, which together have the backing of some 35% of Muslims. Meanwhile, the SLFP is the preferred party of nearly 75% of Sinhalese – Sinhalese being nearly 75% of the population, this alone gives it a good shot at 55% of the popular vote. To have any hope of ending its losing streak, the UNP needs to rebuild its base among Sinhalese. Some analysts argue that the SLFP’s popularity is due to the war victory, so we shouldn’t be surprised by the number or scale of its electoral successes, which have given Mahinda Rajapaksa amongst other things a two thirds majority in Parliament – a feat that was supposedly impossible with proportional representation. That a more balanced distribution of power would be good for the country is widely accepted. They suggest that things will get back to ‘normal’ in a while, even if no action is taken. In other words, there is no cause for concern. However, such confidence in the automatic revival of the Opposition is misplaced. Voters are more discerning than they think. Having ended a war is no guarantee of support, as Winston Churchill found out within months of Hitler’s death – the British public acknowledged his brilliant wartime leadership and were grateful, but many of them preferred to have somebody else in charge of the recovery. Sri Lankans would have done the same if the UNP had presented them with an attractive alternative. The fact that in the most recent local election – more than two and a half years after the end of the war – the UNP lost strongholds like Kandy that it had held for over five decades demonstrates that there is every reason to worry. 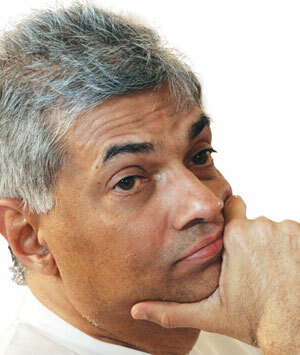 The problem, which I find it hard to believe anybody can fail to see, is Ranil Wickremasinghe. Ranil really is Mahinda Rajapaksa’s best friend. He is irreversibly associated with two policies that much of the Sri Lankan public – certainly the vast majority of Sinhalese – regard as anathema. Also, Ranil doesn’t seem to have changed his mind about them. These are his enthusiasm for appeasement and his commitment to neo-liberal economics. And Ranil isn’t just keen on these policies. He is a radical adherent. His Regaining Sri Lanka programme envisaged a sharp reduction in the role of the state in pretty much every sector, no matter how cherished. And he wasn’t just willing to do whatever it took to do a deal with the LTTE, he went so far as to ridicule the Government’s military campaign almost until it reached the banks of Nanthikadal. He has not admitted that he was wrong. Indeed, he often sounds as though he would do it all again if he had the chance. In addition to being a liability with voters, Ranil is not even able to hang onto the few members his party does manage to get elected. Dozens of his MPs have crossed over to the Government, especially in the last seven years. Of course this is the result of the smart manoeuvring of Mahinda Rajapaksa, but the Opposition too has to be smart. There’s nothing wrong with the Government making use of MPs’ interest in ministerial positions to boost its numbers – this is politics. (Of course it would be good to set a constitutional limit to the number of ministers an administration can appoint.) But Ranil should be able to take advantage too. He should be capitalising on the growing dissatisfaction within the SLFP at the dominance of Mahinda Rajapaksa and his family and their plans for his succession. I can’t think of many other democratic countries in which the same person has been in charge of a major party for as long as Ranil Wickremasinghe. In the UK, Tony Blair took over as party leader just a couple of months before Ranil became leader of the UNP. Even though he won three successive terms for the British Labour Party, in 1997, 2001 and 2005, he was still compelled to hand over power to a successor after ten years as Prime Minister. Meanwhile, the British Conservative Party changed its leader four times until it found David Cameron, who finally defeated Labour in 2010. Imagine their fate if they had stuck with John Major! It is standard practice to bring in new faces – and hopefully also new ideas and new energy – from time to time, even when things are going well. Ranil has been party leader for 18 years, almost all of which have been spent out of office, yet still nobody has been able to replace him. In the circumstances, it is quite ridiculous for the UNP to accuse Mahinda Rajapaksa of clinging onto power, when he has only been in charge for seven years. The worst dictatorship in Sri Lanka is to be found in the UNP. This is exactly the argument made by those who have crossed over. The struggle to eject Ranil has been going on for most of Mahinda Rajapaksa’s time in office. And it has occasionally looked pretty serious – recall the awful death of Rienzie Algama, who set himself on fire outside Sirikotha in July 2010. Ranil’s eventual agreement to initiate an annual secret ballot to select the party’s key office-bearers seemed to offer some hope of change. However, the constituency was only the Working Committee, and Ranil easily won the first round in December 2011 – he beat Karu Jayasuriya by 72 votes to 24. (Polling all party members would obviously give a much better idea of the mood in the country than asking a group of people who are either directly appointed by Ranil or indirectly depend on him.) That there were many in the party who were desperately unhappy with the result was made clear by the violence that engulfed Sirikotha soon after it was declared. Now this violence is being used as a pretext to undo even this very small reform, with the Working Committee announcing last week that the party leader will henceforth be chosen for terms of not one but six years. They say this is essential for party unity. Frankly, why does the party need to be united in defeat? In any case, party unity is overrated. Plenty of leaders, from Margaret Thatcher to Mahinda Rajapaksa, and even leaders of the UNP in its more dynamic era, have won elections despite vicious infighting – it can even bring out the best in them. Six year terms will enable Ranil to stay on until 2018. That is until after the next general election. This must be music to the ears of Mahinda Rajapaksa. His strategy is clear – he intends to make the UNP face one election after another in the next few years, to keep its members obsessed with party unity. They will think twice about agitating against their leader if they are constantly in campaign mode. And they won’t have the spirit to resist Ranil when they are continually reminded of what bad shape the party is in, courtesy their regular election defeats. Because Mahinda Rajapaksa would love nothing better than to compete with Ranil for the presidency again – his unprecedented third term. 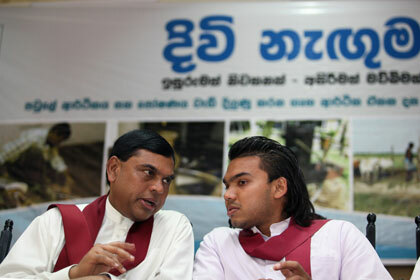 He wants to ensure that the UNP never recovers from its crisis. The UNP can’t play somebody else’s game. It must forget about the Eastern, North Central and Sabaragamuwa Provinces, which are not very important in comparison with what is at stake in Colombo, and instead refocus its efforts on choosing the most suitable leader and working out a new and more appealing programme for the next general election. This article was published in the Midweek Review on 25th July 2012. The internet version can be accessed here.